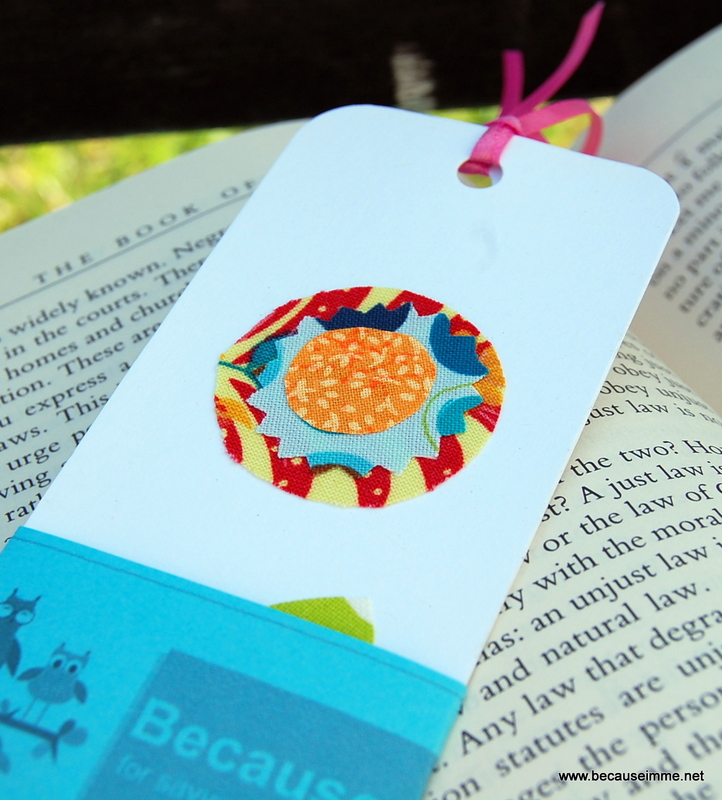 It was suggested that I make bookmarks for craft shows. 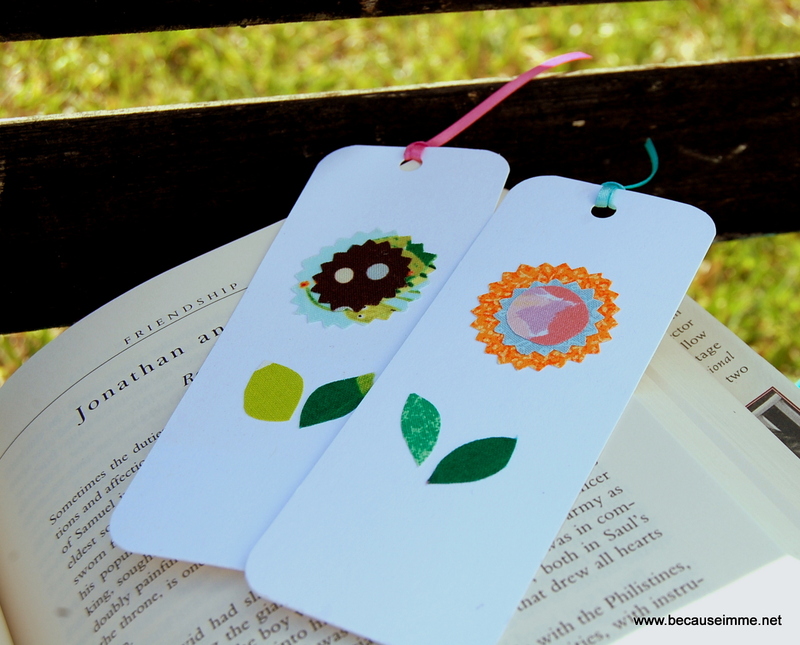 Being me I made completely different bookmarks than were recommended to me but I had so much fun with these. So much that I couldn't stop and made three different styles. The first set, of flowers, are created by first bonding two sheets of card stock with spray glue. Once the glue had set a bit I cut the paper into eight equal sections, making sure the outside edges were also neat and tidy. Then the fabric scraps used in the leaves and flowers were adhered to fusible web, like Heat and Bond Lite. I cut the desired shapes and placed them where I wanted them. I pressed the fabric to the paper with a hot iron, with a barrier of cloth between the iron and all the bookmark pieces. To finish I trimmed the edges with a round corner paper cutter and cut a hole in the top to attach the ribbon. Little bits of ribbon were attached for added color. 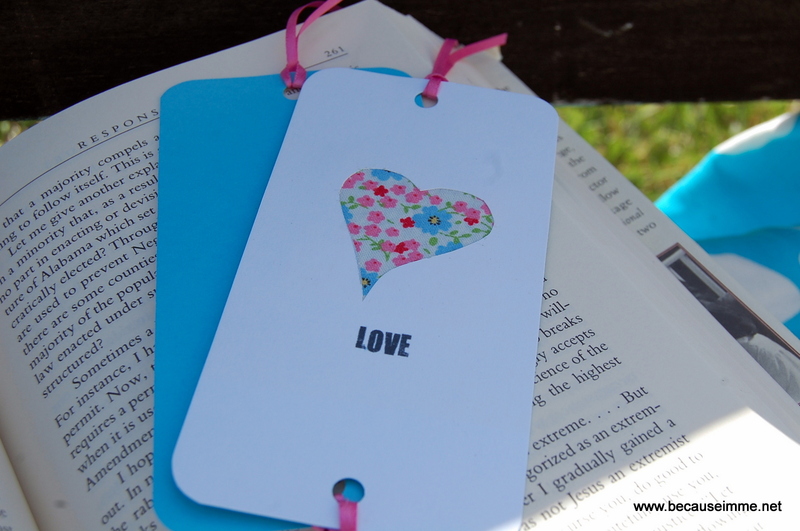 To create the second set of bookmarks I went into Picnik and and created a collage - faint gray heart on top, the word "Love" on the bottom, saved it and printed six onto a sheet of white card stock. Using an Exacto knife I cut out the hearts. I sprayed the backside of the love/heart card stock page with spray glue and carefully placed a square of floral fabric, backed with interfacing, over the heart (still on the backside). I then sprayed a sheet of blue card stock with spray glue and adhered it to the backside of the love/heart card stock page. I cut six hearts out of the card stock sandwich, added a hole and ribbon, and rounded the edges. 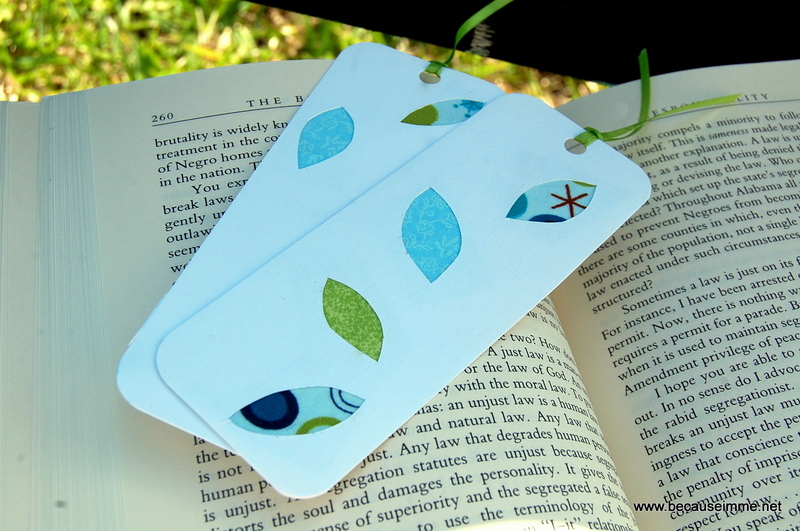 This last set of bookmarks was made by first cutting two sheets of cardstock into 8 sections. Into 1/2 the sections I cut leaf shapes with an Exacto knife. Spray glue was sprayed onto the backside of the cut out sections. 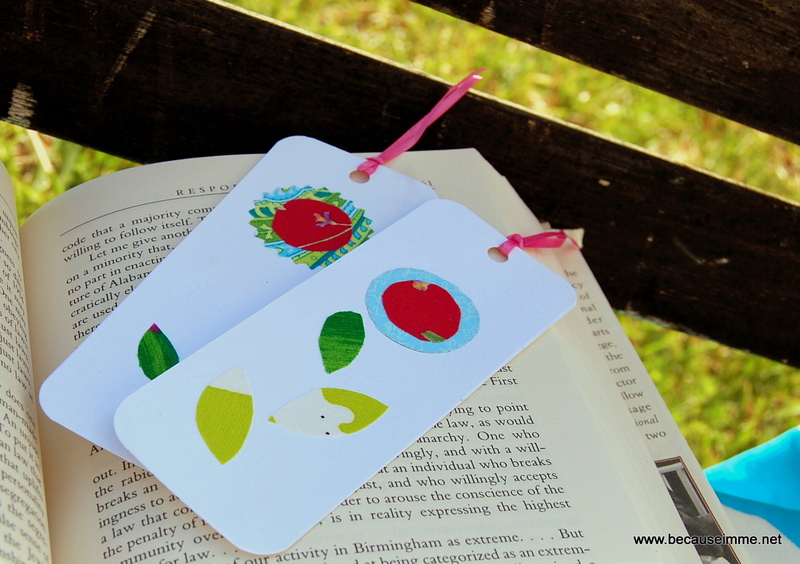 On the backside of the leaf shapes I placed little scraps of fabric. The backing pieces of cardstock were then sprayed with glue and attached, creating a nice sandwich. Sides were trimmed, edges were rounded, holes and ribbon were added. More instructions at How About Orange. 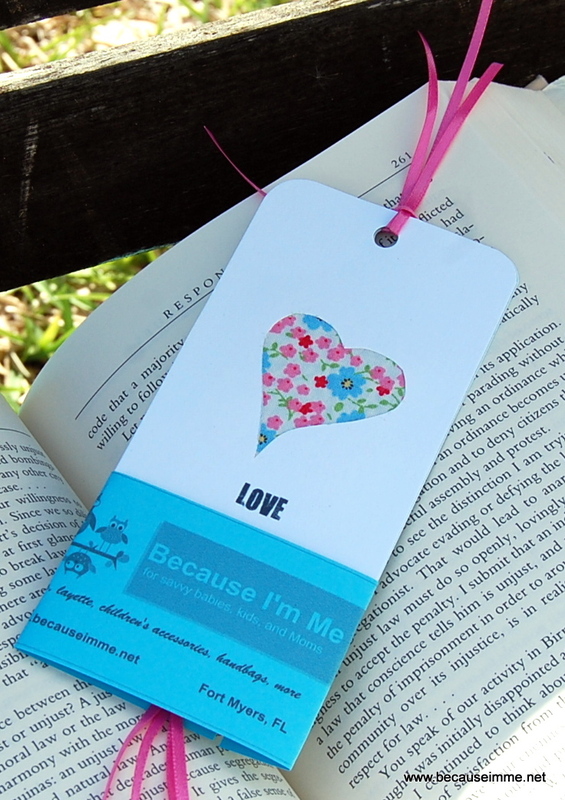 All the bookmarks are packaged in sets of two, wrapped with cardstock paper labels.